The traditional burial-place of the prophet Ezekiel, around which many sagas and legends have gathered, is shown at Kefil near Birs Nimrud; for centuries it has been a favorite place of pilgrimage for Mohammedans as well as for Jews. The mausoleum, dating probably from the time of the califs, was regarded already in the twelfth century as the work of King Jehoiachin, who is said to have erected it when he was liberated from prison by Evilmerodach. 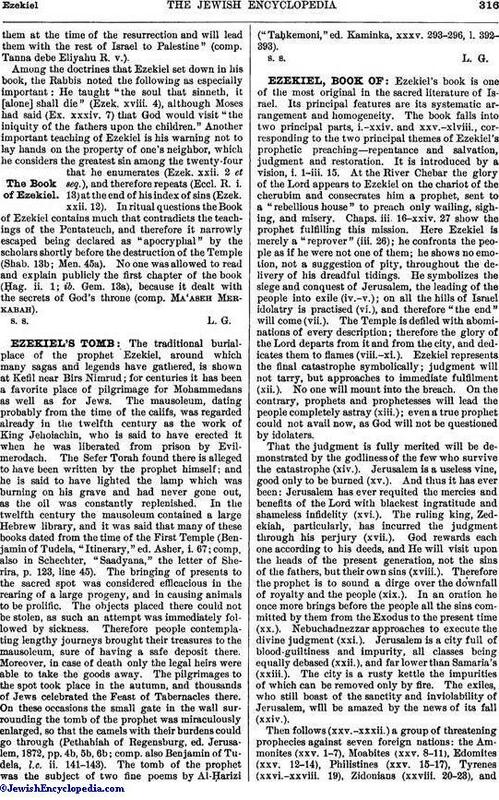 The Sefer Torah found there is alleged to have been written by the prophet himself; and he is said to have lighted the lamp which was burning on his grave and had never gone out, as the oil was constantly replenished. In the twelfth century the mausoleum contained a large Hebrew library, and it was said that many of these books dated from the time of the First Temple (Benjamin of Tudela, "Itinerary," ed. Asher, i. 67; comp. also in Schechter, "Saadyana," the letter of Sherira, p. 123, line 45). The bringing of presents to the sacred spot was considered efficacious in the rearing of a large progeny, and in causing animals to be prolific. The objects placed there could not be stolen, as such an attempt was immediately followed by sickness. Therefore people contemplating lengthy journeys brought their treasures to the mausoleum, sure of having a safe deposit there. Moreover, in case of death only the legal heirs were able to take the goods away. The pilgrimages to the spot took place in the autumn, and thousands of Jews celebrated the Feast of Tabernacles there. On these occasions the small gate in the wall surrounding the tomb of the prophet was miraculously enlarged, so that the camels with their burdens could go through (Pethahiah of Regensburg, ed. Jerusalem, 1872, pp. 4b, 5b, 6b; comp. also Benjamin of Tudela, l.c. ii. 141-143). The tomb of the prophet was the subject of two fine poems by Al-Ḥarizi ("Taḥkemoni," ed. Kaminka, xxxv. 293-296, l. 392-393).